Bridging caused by raising of external ground (flower beds) or internal floors. This can also occur where internal suspended timber floors have been replaced with solid floors. Absence of a DPC, often in older buildings. Permeable building materials such as brick, stone and mortar allow damp from the ground to rise by capillary action, carrying with it ground salts, which include chlorides and nitrates and sometimes calcium. Due to their presence when the humidity in the building is high, dampness will become more apparent. Rising dampness, within a wall, in it’s true form rarely extends higher than around 600 – 750mm above the floor level. However, in some situations, the signs of dampness can sometimes go higher. 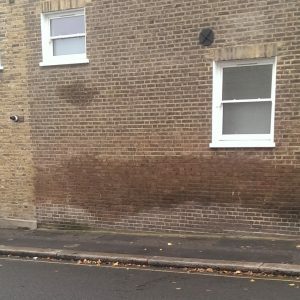 If the wall has been affected by rising dampness for some time, high concentrations of hygroscopic (moisture absorbing) salts can be found at the position in the wall where the water evaporates. It is important to mention that the amount of water that is absorbed by salt contamination will vary with the humidity of the atmosphere within the room/property. This can appear as white flour like dusting or crystallisation deposits, known as ‘efflorescence’. Salt efflorescence is the result of sulphates and indicates where dampness has been present but the water has evaporated. This can ruin decorations and can cause a break-down and spalling of the existing plaster/decorations. There is a distinct difference between hygroscopic salts (chlorides and nitrates) and efflorescent salts (sulphates). Efflorescent salts indicate that dampness has been present – and may be again – but the white, fluffy salt deposits will not continue to absorb moisture. 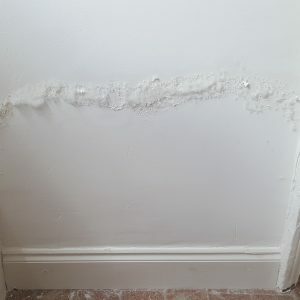 Whereas hygroscopic salts will remain in the wall substrate and the plaster and will continue to absorb moisture, which could be atmospheric dampness or form within the wall substrate. Decay to the timbers, such as Wet Rot and Dry Rot. Infestations by woodboring insects particularly if the ground floor is of a suspended timber construction. There are three different ways to determine and/or measure moisture in brickwork and other masonry. Electrical – Conductivity and Capacitance, along with radio frequency search mode. Chemical – by use a Carbide method. Gravimetric – oven drying method. The most common, less destructive, approach is an Electrical method, which can be taken quickly and easily. It is important to note that readings obtained using moisture meters are qualitative, not quantitative, as they are responding. 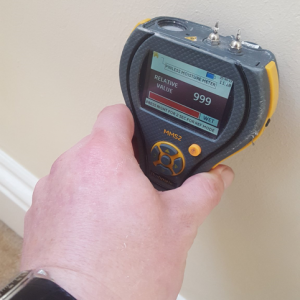 Moisture meter readings are taken on a relative scale and when taken from a wall surface are expressed as a “wood moisture equivalent” (WME). For further reference, please refer to BRE Digest 245. Conductivity Meter tests are completed by placing two probes on the surface, or by embedding them in the depth of the wall. The resistance of the wall and the meter’s reading are influenced by the moisture in, or on the wall. This is useful in experienced hands to interpret the results given, which are normally taken from the base of the wall rising upwards. However, it is important that the use of meters is also accompanied by a proper visual inspection so that all other factors can be considered. Simply putting a meter on a wall is unlikely to provide a proper diagnosis. Chemical Methods together with Gravimetric Methods require destructive drilled samples to be taken. Preservation Treatments are able to use both of these methods, although charges for this service may be applicable. 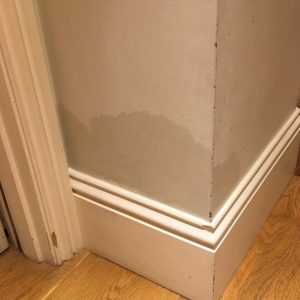 The most important thing to do is to contact an established company with years of experience carrying out damp proofing work, who are members of the PCA (Property Care Association). They will arrange for one of their CSRT (Certified Surveyor in Remedial Treatment) Surveyors to carry out a detailed inspection of the specified area. The Surveyor will then provide a detailed Report/Quotation. The type, age and construction of the property. Internal and external observations on the property. The Surveyors recommendations for works required i.e. the installation of a Chemical Damp Proof Course. Quotes for any further associated works, such as specialist re-plastering using a salt resistant specification/plaster mix. Why come to Preservation Treatments? We have been established since 1972 and we are very proud to say that a significant amount of the work which we carry out comes through existing clients and recommendations. We are award winning members of the PCA. All of our Surveyors are CSRT qualified, with continued CPD training throughout their year. Two of our Surveyors are on the PCA Waterproofing Design Specialist (WDS) Register. We are able to offer GPI (Guarantee Protection Insurance) back-up insurance on most aspects of our work. All of our staff are trained in Health and Safety aspects of work. We have numerous trade affiliations including CHAS (Construction Health and Safety), Safecontractor and Constructionline. We are also proud to be BS ISO 9001:2015 Quality Management and BS ISO 14001:2015 Environment Management system accredited.